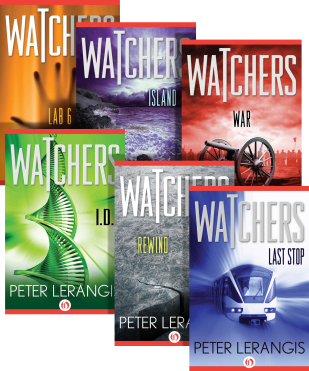 ** EXCELLENT NEWS: ** The entire Watchers series is back in print, via Open Road Media, as eBooks! This is my first series, six mind-bending stories dealing with unexplained phenomena: parallel worlds, time travel, cloning, androids, and soul-upload. 1: Last Stop. David’s father is presumed dead, until David sees him on an abandoned subway platform come to life — or did he? 2: Rewind. Adam finds a videocam that views the past. Now he can see his friend’s death four years ago. Can he change it? 3: I.D. Evie must find her clones, who are dying of a mysterious illness at precisely the same age — before her time comes! 4: War. War-loving Jake finagles his way onto the set of a Civil War film, only to find the war is real … and he can’t get out! 5: Island. Wealthy Rachel follows a hot yacht-club busboy, Colin, to a strange island where no one ages, or escapes. 6: Lab 6. Sam is caught up in a bizarre experiment to extract his never-born twin — who is inside him.